Sports Mascots with Farm Connections - JP loves LIFE! For a city girl, I have to admit I’ve had my share of sports mascots with farm-related themes to them. The revelation came to me recently as I looked for a way to camouflage a bad hair day and pulled out my Lubbock Cotton Kings cap (photo at right). The Cotton Kings really stood out for me cause I was working in the cotton industry when I first saw it and I loved that someone was twisted enough to black out the teeth on a cotton boll. They changed logos going for a shield that was far more respectable before the team suspended operations. But I have crossed paths with several other really strange agriculture- or farm-related mascots that are definitely worth mentioning. Phillips University Haymakers (Enid, OK) — I went to a college in the middle of nowhere it seemed. And of course, such a small school in a smaller town than I had known, had to have an off-beat school mascot. Seriously, our teams were called the Haymakers! I’m not sure why that was the chosen mascot, it seemed Enid, Oklahoma was far more into wheat production but they didn’t ask me. Oh, and had they asked the students it was Lil Hay, a skunk that played on the school’s abbreviation PU. Yes, it was funny and at the time I had no idea how closely connected skunks were to agriculture. And the local high school’s mascot was the Plainsmen which I assume related to the land run and the folks who settled and farmed the area. Lubbock Cotton Kings — I sort of explained them a bit up above but must say the reason I have a cap and a shirt is funny. The company I was working for was building a large facility near Lubbock, Texas several years ago. I had been out there a lot & one day stumbled on the Cotton Kings gift shop and had to get myself an off-beat souvenir. We were hosting a media event out there when Dallas-Fort Worth happened to most of the people trying to make the trip. The insanity of travel made me think something unique was in order. I went back to the store & bought several different things and had to get myself something else as well! Delta State University Fighting Okra (Cleveland, MS) — This mascot and it’s image on t-shirts, caps, etc made me laugh frequently when I first moved to Cleveland. I learned fairly quickly though that it is one helluva vegetable with attitude! Not only did I have to have one or two, but I found they made great gifts! And yes, all my nieces got Fighting Okra t-shirts and it seemed I had people placing orders every time one of them wore their shirt! This summer I got used to seeing the “Corn Crib” tweeted as friends regularly attended baseball games by the Normal CornBelters in Illinois. Chuck Zimmerman of AgWired worte this blog post about the team. Of course there are those high profile teams with an ag connection like the Huskers from the University of Nebraska, which at one time used the BugEaters as their mascot. I have to say, that makes the Phillips Haymakers sound way better… Nebraska BugEaters? Really? I saw a tweet from the @CobSquad that read “#FunFact #UNL “Cornhusker” football team was know as bugeaters until 1900.” Not sure why I can’t find it now but I verified its accuracy on the university’s site. I can’t decide whether bugeaters are ag-related, they could be the parasitic wasp sort of thing right? And I’m pretty sure farmers would enjoy having bug eaters around when pests are taking their toll on crops! Before I go, I know this isn’t an exhaustive list but I found another blog post that talks to some of the other ag-related sports team mascots. You may enjoy it, I did. Do you have any other farm-focused teams I should know about, be cheering for or consider a purchase of merchandise? It seems I’m getting quite a collection! What about the Oklahoma State University Cowboys? I think we are most certainly Agriculture Related! Certainly are and a great oversight on my part, especially since I have great friends in the Stillwater area! Thanks for helping me get them on the list! I love it! Thanks for the add Heather! Regarding Bugeaters: there was a derisive piece written in some east coast publication about Nebraska saying basically that there was nothing there and nothing to eat but bugs. There was some truth to the assertion, as some of the homesteaders who faced drought conditions had to subsist on what they could find. The nickname was accepted as a symbol of the toughness of Nebraskans (and not as the misinterpretation of an insult like the Missourians who didn’t understand anything without being shown how to do it). I’ve absorbed about every bit of University of Nebraska trivia over my lifetime, and I’ve never heard the parasitic wasp story asserted on the website. Sounds like some intern got a little creative to me. 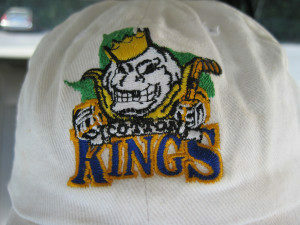 The Cedar Rapids Kernels old logo is baseball coming out of cornhusk. My favorite baseball and corn. Also Monroe WI Cheesemakers! University of Arkansas – Monticello has to make the list with thier mascot: The Fighting Boll Weevil! Let the boll weevil eradication program jokes begin! I lived in Lubbock when the Cotton Kings were there and even went to a game. Nice name to pay respect to what makes the Lubbock economy tick. HAD to look to see what the mascot looks like… check out this photo! It is a strange one! If I am not mistaken, it is also the “smallest” mascot, when compared to actual size of the organism, of all the collegiate mascots that represent something that is actually found in nature. I think that a team playing UAM would have plenty of material to creative cheers and stunts. Maybe instead of an Air Force fly over to begin the game, maybe a few crop dusters in formation would be more interesting! Don’t forget these high school teams–the Early (IA) Cattlefeeders and the Moorhead (MN) Spuds! Seriously? The Early Cattlefeeders? That gives a whole new meaning to morning chores! The high school down the way are the “Cornjerkers.” And their mascot is an ear of corn with arms, legs and a head…weird! I need to know what school that is & find out if we can get a photo! That sounds wild! We didn’t have a farm related mascot in high school, but other schools used to make fun of us because our football field was right beside a farm and the cows used to watch our games! That’s funny! I think cows really seem to look at folks like we’re nuts a good bit… would be especially poignant in a tough season. My kids school is a Patriot. I know they are supposed to use an old US Soldier but the principal doesn’t want to display or promote gun use. So they use this blue blob thing. It’s pretty funny. That’s kind of interesting. I went to a school that used the patriots and had a minuteman in red, white & blue. I think he had a musket but not sure. Cool! Thanks for adding a team I hadn’t thought of!